Candle light is the beautiful surprise gift for a girl when you want to express you love and feelings. Valentines Day party on Thursday as the DJ SUMAN SINGHA & DJ ESPROYSO are going to spin the ENERGETIC Bollywood tracks and to add romance to the moment we have 2 singers from North-East. BUY 1 N GET 1 FREE COCKTAILS. 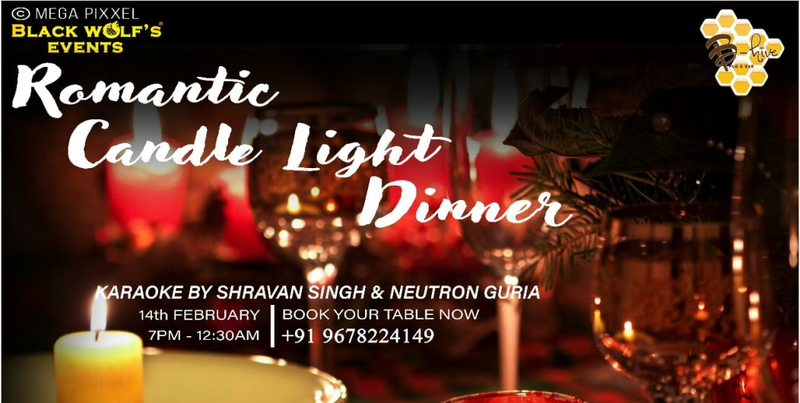 Limited seat available for candle light dinner. Reserve your table soon !! SURPRISES ARE AWAITED FOR COUPLE, BOOK SOON !! The entry closes at 9:00 PM. Cover charges will be applicable post that as per venue’s discretion. Special Details: Event will start 7.00pm onwards. Post 9.00pm cover charges will be applicable.